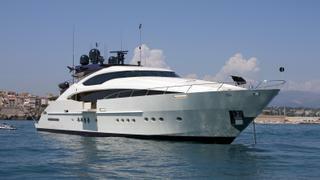 The 45.72 metre motor yacht Clifford II, listed for sale by Moran Yacht & Ship, has been sold. Built in aluminium by US yard Palmer Johnson, she was designed by Nuvolari Lenard and delivered in 2008 as the yard’s fourth PJ150 Sports Yacht. MCA compliant, her accommodation is for up to 12 guests in five staterooms plus quarters for eight crew. The full-beam master suite of this yacht for sale is located on the main deck forward and includes a lobby with a walk-in wardrobe, a king-sized bed with a study area to starboard and a seating area to port. Below deck, guest accommodation includes a VIP cabin with a saloon area. This area can be isolated and turned into a separate cabin with its own en-suite bathroom. Two further double cabins can be turned into twin cabins at the push of a button and all cabins have en-suite bathroom facilities. Clifford II was designed for guests to enjoy life outdoors — the flybridge boasts a Jacuzzi with sun loungers, a dining area and a large seating area in the shade with a pop-up flatscreen television, not to mention panoramic views in all directions. Privately owned and never chartered, Clifford II has been kept in immaculate condition with a series of upgrades carried out in 2015 and 2016. Powered by twin 3,650hp MTU engines, she can reach speeds of up to 26 knots and her Trac stabilisation system ensures a smooth cruising experience. Clifford II was asking $14,000,000.